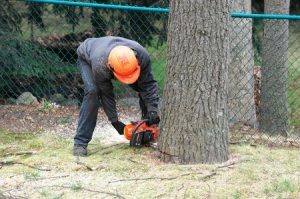 If there’s a tree in your yard that is unhealthy or growing dangerously close to your home, you may be thinking about trying to remove it yourself. While this might sound like a good way to save a little money, removing a tree on your own is often more dangerous than it’s worth. Here are a few of the dangers you may encounter when tackling tree removal on your own. You or the tree could come into contact with power lines. Power lines are common obstacles that can make tree removal seriously tricky. In the event that the tree falls towards nearby powerlines, it could knock out power to your neighborhood and put you at risk of electrocution. Not only is this a very dangerous scenario, it could end up costing you more money if you have to pay to have your utilities repaired. The tree could fall toward your house. There are certain cutting techniques that must be used to bring a tree down safely in the desired direction. If you haven’t removed large trees before, you probably don’t have much experience with these techniques. One wrong move could send the tree crashing down on your home, potentially causing thousands of dollars in damage. You could injure yourself with tree removal equipment. Tree removal typically requires heavy equipment like chainsaws and wood chippers. If you don’t know how to use this equipment properly, you could accidentally hurt yourself or others. There have even been cases of people dying during botched tree removal operations in the past. It’s always best to err on the side of caution when it comes to tree removal. At Brother Tree & Lawn, our team of trained professionals can remove decaying trees safely so that they no longer pose a threat to your home. To schedule an appointment, give us a call or contact us online today!